ACF Consulting Blog: Google+: The Next Big Thing? Google+: The Next Big Thing? Over the past few weeks, you’ve probably heard a little bit about Google+, the new social network by the search engine giant. With the introduction of this new network, a lot of business owners are wondering if it’s something they should be using. The below post gives an overview and review of some of the features of Google+. The interface is simple, clean and fairly easy to use. Importing your personal information is easy (if you have a Google account profile filled out already, Google+ imports it) and you can import contacts from your email accounts into your circles. Right now, Google+ looks like if Twitter and Facebook meshed together (taking the best features of each service), but it certainly has plenty of room to grow, which surely it will. Is it the new thing? There’s been a lot of talk around the internet that Google+ will replace Twitter and Facebook. While we can certainly see it giving the 2 social networks a run for their money, we’re not sure Google+ will replace them altogether, or if there’s even a need for that to happen. People use social networks for different reasons, so there’s no real reason to feel like you have to replace one with another. Why not use Twitter, Facebook and Google+? Since Google has had 2 previous attempts at social networking that fizzled out (Google Wave and Google Buzz) a lot of people are wondering if Google+ will do the same thing. Only time will tell if this catches on, but so far in the few weeks it has been around, Google+ has gained millions of users, most who seem fairly happy with service, so we have a feeling it will be sticking around. Should I use it for my business? 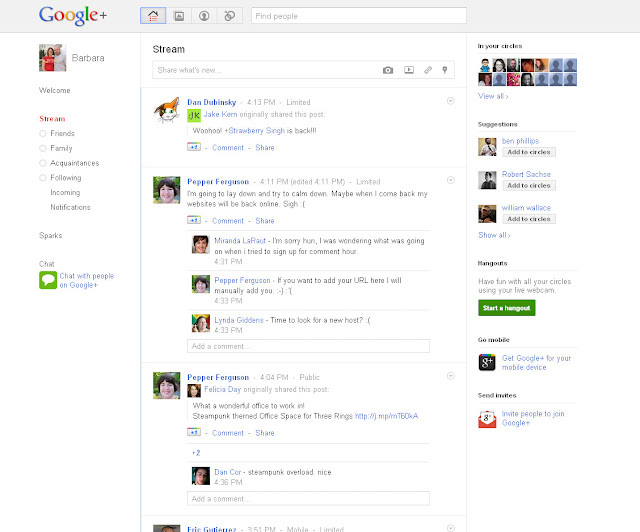 Right now, Google+ is meant to be used on a personal level. In fact, Google has asked businesses to “hold off” on creating consumer profiles for now because they plan to launch a section of the network that will allow business owners to create pages by the end of the year. We’re very excited to see what Google+ has in store for businesses. Google+ is a social network that definitely has potential to grow into something great. It’s easy to use and combines a lot of the things we like about other social networks. While we don’t think it will out the other big social networks, we definitely can see it becoming another big player. We’re excited to see the future of Google+ and how it will fit in to social media marketing.